Welcome to the homepage of Chiatanya Designs—run by Australian designer and tutor Fiona Hammond. On this site you’ll find information about creative workshops offered by Fiona, and you can view a selection of her jewellery, textile art, quilts and more. Please browse through Fiona’s photo galleries and enjoy her colourful approach to her many creative pursuits. Fiona is a mixed-media artist whose love of beads, textiles and fibre has led to an eclectic array of wearable and non-wearable pieces since 1999 (fuelled by her lifelong passion for all things crafty and creative) – everything from contemporary quilts to jewellery and sculptural forms. Two of my coiling adventures from 2014 – both were made for the ATASDA biennial exhibition at the Palm House Gallery, Sydney Botanic Gardens. The exhibition was titled Future…Past, and all artworks made by entrants had to take their inspiration from something in each artist’s personal past. 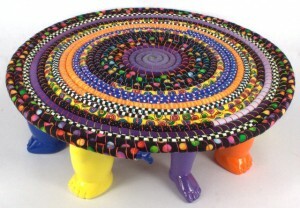 The piece pictured above left is called Dancing Platter, and it references my treasured 1980s Carlton Ware teapot with legs, as well as the colourful clothing I loved to wear in that decade. 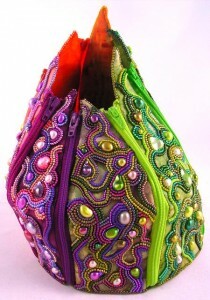 Fiona’s main modalities are beadwork, quilting, textile arts, hand-stitching and coiled basketry. She is well-known for her love of vibrant colour and a somewhat quirky aesthetic. She loves to combine mediums for her creations, for example textiles often feature in jewellery, and beading appears on textiles. 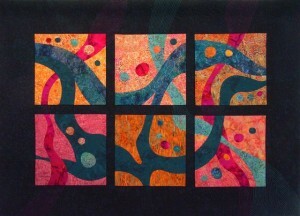 Her quilts usually have a contemporary feel, and show a strong colour confidence. Beading with seed beads is a constant source of pleasure for Fiona and this is reflected in her one-off jewellery pieces as well as bead embellishment of textiles. Her quilts, jewellery, coiling and other textile arts have appeared in Australian quilting, beading and textile art magazines, as well as exhibitions, shows and competitions. She has received many awards and prizes for her work over the years. Fiona is an enthusiastic teacher in the field of creative arts and crafts, and loves to share her knowledge and skills with her students. She is very willing to travel far and wide to teach her workshops for groups, shops, guilds, symposiums, retreats, etc. Braidwood is about half-way between Canberra and the south coast (Batemans Bay), and it has much to recommend it for a visit or stay – from shops selling unusual and hard-to-find-elsewhere items, to lovely historic buildings (many from Braidwood’s gold-mining past), and more. There is a definite creative influence too, with many artists and artisans resident in or near the town, and regular exhibitions in several locations. 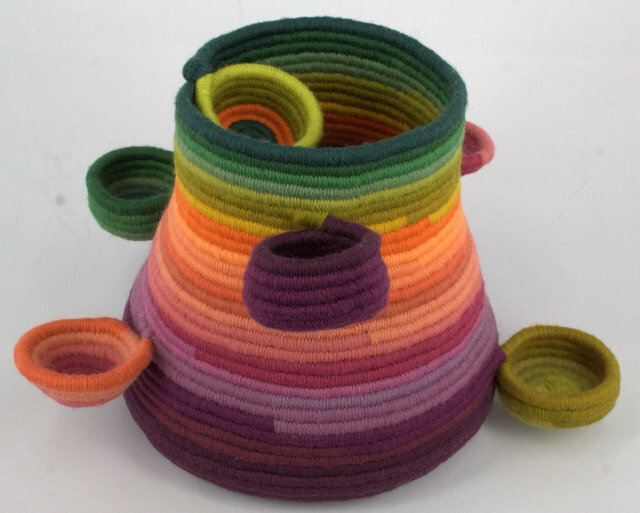 Since its inception on October 10, 2015, Fiona has been a member of Untethered Fibre Artists. This group of around 20 textile artists came together through a shared passion for textile arts and the desire to further the understanding of, and interest in, such creative works through annual and travelling exhibitions. Group members each create 2 artworks for each annual exhibition theme, and the exhibitions are seen first in Sydney, and then at a range of galleries and exhibition spaces around Australia. The above photo shows Fiona’s installation Faded Glories: The Ebbing of Ancient Archaeological Wonders, created for the 2016 Untethered exhibition Ebb and Flow. 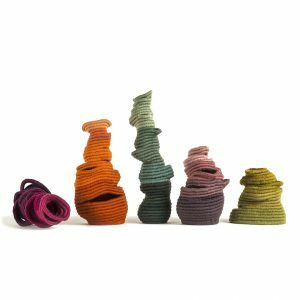 This installation is comprised of 5 individual coiled sculptural forms. Photo by Janet Tavener. 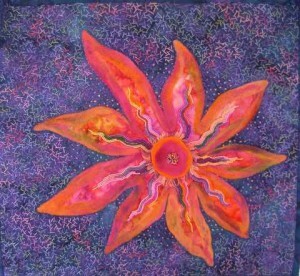 “Botanical Oddity”– a small art quilt, measuring 54 cm x 50 cm. This quilt has won several awards, including the Down Under Quilts Best Use of Colour Award at the Canberra Quilters Exhibition in 2008. Fiona Hammond is passionate about making jewellery, textile art and quilts, and loves to teach others how to make their own creations. Her many years of teaching all kinds of topics, from primary school classes to Diploma of Aromatherapy courses and now her craft workshops, have instilled in her the joy of teaching and sharing her creative ideas with others through her workshops. She loves to inspire her students to try something new and have fun along the way. New workshops are constantly being developed and then made available. Comprehensive written notes are provided for all workshops, for a nominal cost. Kits are sometimes available for specific workshops. “Zippity Do-dad” beaded sculpture, made for the Art award Winners Exhibition at Goulburn Regional Art Gallery in December 2010. This piece represents 3 months of my working life in 2010. It is made from cotton fabric, interfacing, Japanese seed beads, freshwater pearls, zippers and nylon beading thread. Fiona is willing to travel far and wide to teach her workshops for guilds, retreats, symposiums, shops, craft fairs, etc. SEE THE EVENTS PAGE FOR INFORMATION ON UP-COMING WORKSHOPS AND OTHER EVENTS, SUCH AS EXHIBITIONS. The above item, Six-Part Harmony, was awarded second prize in the Professional Small or Wall Quilt category at the 2012 exhibition of the Quilters Guild of NSW (seen at the Craft and Quilt Fair in Sydney in June), and third prize in the Art Quilt category, plus the special Batik Fabric prize (sponsored by Claire Ayling Bali Batiks and Mandelson’s of Goulburn) at the 2012 Canberra Quilters exhibition (seen at the Craft and Quilt Fair in Canberra in August). It also received first prize plus the champion ribbon at the 2013 Royal Canberra Show. Fiona originally made this wall quilt for her joint exhibition Textile Trio, held in April/May 2012 at The Q Exhibition Space in Queanbeyan, NSW. She shared this exhibition with her two friends, Wilma Cawley and Sandra Fisher. Fiona’s desire when designing this quilt was to create several small “quiltlets” and see if she could successfully bring them together in one quilt. To this end, she pre-quilted the background to allow the main quilting lines within the quiltlets to continue out into the border area. This helps to establish a flow from one quiltlet to the next. Fiona now has a two-day workshop available, based on Six-Part Harmony. The workshop is titled ‘Two-Part Harmony’. In this workshop participants will either design their own two quiltlets or use two adjoining panels from her Six-Part Harmony quilt to create their own contemporary wall quilt, using the techniques and concepts that she used in her quilt. For more information about this workshop please see the Two-day Quilt Workshops page.